Other Voices, 3.1 (May 2007), Paul A. Youngman, "Critical Interventions: Reclaiming the Virtual," review of Mark Nunes, Cyberspaces of Everyday Life. 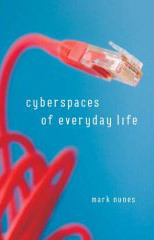 Review of Mark Nunes, Cyberspaces of Everyday Life (Minneapolis: University of Minnesota Press, 2006), xxvii + 223pp. ISBN 0-8166-4792-5 [ISBN13 978-0816647927]. In an essay dating back to the mid-1990's, Jean Baudrillard breathlessly proclaimed the murder of reality at the hands of the unforgiving pace of media "real time." The essay, The Perfect Crime (1996), laments a "deep seated virtualization of human beings" not marked by the absence of reality, but rather by ultra-reality or hyperreality, which has had the paradoxical effect of "devitalizing" the spaces we occupy in the world.1 Baudrillard's hyperbolic piece is an apt example of what Mark Nunes might refer to as a "first generation" book on the social, political, and cultural effects of computer-mediated communication that partook in dystopic, nightmarish depictions of the network society. In Nunes's monograph, yet another brilliant contribution to the Electronic Mediations series put out by the University of Minnesota Press, we have an illustration of a "second generation" book that embraces Baudrillard as part of its historical roots, but also attempts to mitigate the alarmist rhetoric in an effort to make us understand that computing technologies and the virtual spaces they create do not have to be mysterious and frightening aspects of the digital age. In this sense, Nunes views his own work as a critical intervention. Nunes does an excellent job of explaining the existence of cyberspace as a function of "historically specific negotiations" and not of some frighteningly "irresistible force of technological determinism. "2 In his tracings, he begins with the question "Where is cyberspace?" and ends by reiterating the need to not simply dismiss the network society as something that falls under the purview of technical people like Bill Gates and Bill Joy, but also to not allow it to become a mere abstraction as it has become in the discourse of the critique of semiotic media and their impact on the symbolic. In the four chapters that lie in between those thoughts, Nunes first provides a historico-theoretical explanation of our concept of space that successfully undermines a simple dualistic understanding of "real space" and "cyberspace." He then applies that theoretical construct to, as the title explicitly states, cyberspaces of everyday life. In Chapter 2, his interest lies in Web pages as spaces of control and, at the same time, spaces of great freedom that perpetuate the human urge to make the world both comprehensive and comprehendible. Chapter 3 provides a comparative analysis of the rise of the British postal system in the Enlightenment era with that of the growth of email in the last decade in light of the way in which both systems impact(ed) the Western conception of public and private spaces. The final chapter addresses computer-mediated communication in the university setting and the establishment of a point-and-click model of learning as the dominant model. It is a model of our understanding of space, however, that is the focus of Chapter 1. In an effort to refute an understanding of cyberspace as a purely conceptual structure and establish it as a material, conceptual, and experiential process at once, Nunes turns to Newton and Leibniz. He describes absolute Newtonian space as a container waiting to be filled with objects. Newton's is a conception of space that has stubbornly remained in the popular Western consciousness, thereby explaining some of the contemporary difficulty with grasping cyberspace, i.e., we cannot place "real" objects in cyberspace so how can it be space as it is commonly understood? By contrast, Leibniz's idea of space in terms of the forces that exist between objects assists us in understanding space as a produced event. His relational space takes the material and the conceptual into account not as distinct entities, but as processes that produce the virtual topographies we navigate in our everyday (lived) existence. In this way, he establishes the process as a dialectical one taking care not to abstract the semiotic system from its material infrastructure. In Chapter 2, Nunes applies his theory of space to the Web. He points out that all Websites establish themselves as a "place" on the network, not existing as Newtonian, geographic spaces, but as Leibnizian spaces formed by their relations to other sites and documents through a hypertext structure that allows for infinite linking. Thus, even though well-known corporate sites like those affiliated with Time Warner for example seek to enact their sites as spaces of control, cyberspace, given its relational nature, is paradoxically a space of great freedom as well. Another apparent paradox established by the Web is the idea that it is both globally expansive and locally situated. I can create "my Web," but I can still feel as though I am plugged into the wider world. Both of these paradoxes, freedom/control and global/local, assist in our understanding of the Web as a tool that makes the world both graspable and expansive at the same time. Yet another dichotomy impacted by the World Wide Web is that which exists between the private sphere and the public highlighted in Chapter 3. In order to place this discussion in a historical context, Nunes describes the rise of the British postal system as a network that restructured the public and the private. He points out that this net partook of the lived experience of letter writing (private) along with the material practice of street names (public) and house numbers (private) brought together by the conceptual representation of a new point-to-point network (public). In this way, letters negotiated the private space of the letter writer and the public network that constituted its delivery system. It was the sheer popularity of letter writing that drove the production and establishment of these spaces during the Enlightenment era. Nunes sees the same process occurring with email. He marks no rupture in the social space as many do, but rather an intensification of that space with the network now serving as foreground and not background and with the public and private irrupting into one another rather than merely flowing as it did with the British postal network of old. And of course, as Nunes highlights in his final chapter, one of those spaces of irruption is the academy. He sees the virtual university as a space of mobile privatization traveling with the student wherever she goes. And it is the student and her body that quite literally provides the space (material, conceptual, and lived) for the event known as education. In a move from the real space of the traditional university to the cyberspace of the virtual university, student bodies have become cyborg inasmuch as their educational performance is dependent on their fluency with computer-mediated communication through a point-and-click interface. The cyborg nature of the student body has in fact become so pervasive that it has even become difficult to establish which courses are computer assisted and which are not. This is because the keyboard, so critical to the educational event, has become an extension of the body representing an enlargement of the virtual classroom, thereby allowing for our extended stay in the space known as cyberspace. Nunes's use of the word cyborg and the self-evident way in which he employs it suggests just how far we have come from those heady days of the 1990's. Back then (in the evolution of technology the 1990's are "the old days") there was a great deal of disquietude over the warring realms of the "real" and the "virtual." In 2007, while the relationship between the two is still a topic of discussion, we have come to accept the foregrounded nature of the network in everyday life. We understand that a great many of us in the Western world, not just students, are cyborg in nature. To paraphrase the German technology critic Norbert Bolz there is no more difference between the mechanical and the organic world; technology has the self-evident nature of limbs.3 We are uncontradictedly fused to our tools like the mouse and the computer keyboard, and the fusion with these computing technologies expands our understanding of space as material, conceptual, and lived to the point where Nunes can characterize it as the "banality of the network in everyday life" (159). 1. Jean Baudrillard, The Perfect Crime (London: Verso, 1996) 28, 66, 46. 2. Katherine Hayles, How We Became Post-Human: Virtual Bodies in Cybernetics, Literature, and Informatics (Chicago: Chicago UP, 1999) 20. 3. Norbert Bolz, Theorien der neuen Medien (Munich: Raben, 1990) 98. Paul A. Youngman is an Assistant Professor of German at the University of North Carolina—Charlotte specializing in the field of Literature and Technology. His first book, Black Devil and Iron Angel (2005), deals with the cultural reception of the railway in nineteenth-century Germany. He is also the author of several articles on the literary representation of computing technologies. Professor Youngman is currently at work on a book manuscript entitled Digital Realities or Digital Myths? The Computer and Its Network in Contemporary German Literature. Youngman, Paul A. "Critical Interventions: Reclaiming the Virtual." Other Voices 3.1 May 2007. April 26, 2019 ‹http://www.othervoices.org/3.1/pyoungman/index.php›. Copyright © 2007 Other Voices/Paul A. Youngman. All Rights Reserved.